As many of you know, I am training to ride from Toronto to Montreal this summer in support of the Toronto People with AIDS Foundation. It is a huge amount of time, resources, energy, and dedication to getting my body ready for the week of grueling, late July exertion that I have signed up for. Call me crazy, I wouldn’t deny it. Another major benefit to cycling so much is that I get to explore parts of this fine megacity that I would otherwise never venture to. Yesterday I managed to combine a store visit for work with a mini-training ride. I headed west to Browns Line and Lakeshore. Usually I take the Lakeshore Promenade following the Waterfront trail in and out of sweet residential enclaves, through blossom filled parks, and in and around water treatment plants. But yesterday, I was on a mission to get to Fair Grounds cafe to drop off some samples of chocolate, sugar and other snacky things. Fair Grounds is a micro-roaster that serves up Fair Trade, organic coffee, lovely pastries, and a fair amount of other retailed items like tea and snacks. It is tucked away in an unassuming old bank building on the corner of Lakeshore and 38th or 39th (I can’t remember exactly the cross street). Jeffrey is the ever-present and friendly owner, who works like crazy to offer his customers the best available. They go to farmers markets in the west end, and certainly provide a community building space at the cafe in an otherwise desolate landscape of the low-rise retail strip that looks as if it was forgotten forty years ago. So I had the pleasure of treating myself to a freshly roasted iced americano at the cafe, and on my way back towards the city, I stopped in at Tatsu’s Artisan Bakery. I wouldn’t have noticed it had I not taken the Lakeshore route, and was very pleased with what I found. What looks as if it was probably a Coffee Time or other sterile donut chain at one point in it’s occupation, has been transformed into a handcrafted baked goods hot spot, just across the street from Humber College. I tried the baguette (which from my independent scoring, would have actually won the baguette challenge as posted a few months ago, with a score of 5), a handmade, organic spelt loaf, and a “spinach bagel”, which resembled a bagel only in shape. 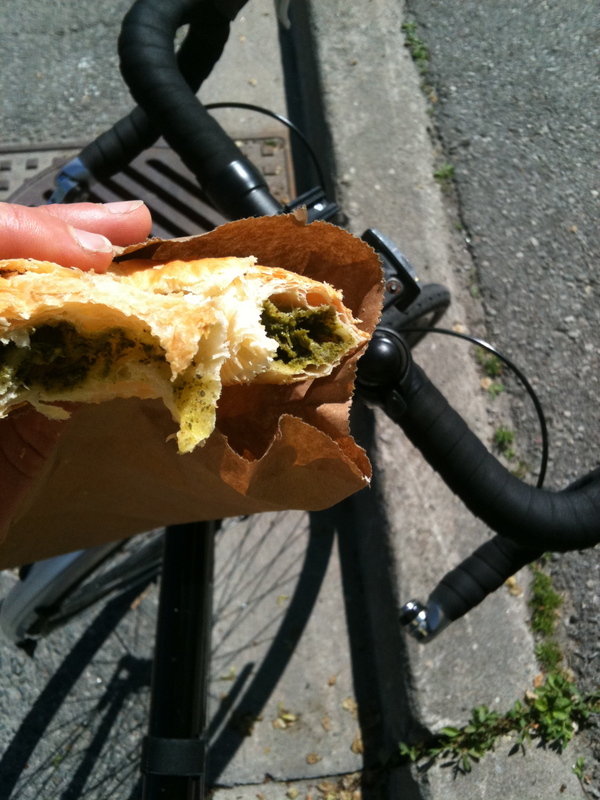 The spinach bagel was a perfect cycling snack, flaky pastry and gooey, salty spinach mush in the middle, kind of like a traditional English sausage roll, but with spinach instead of sausage, obviously. The other west side discovery I have made is up Brown’s Line, just north of Horner Ave. It’s called Organic Big Burger. I don’t eat beef, but if you do, the meat comes from Beretta and they pride themselves on offering clean fast food. But the piece de resistance at Organic Big Burger is MAPLETON’S SOFT SERVE ICE CREAM!!!!!!! That’s right, I said it. Family farmed, organic, LFP certified, sweet, delicious soft serve with no trace of petrochemicals, hydrogenated oils, or the crap that usually makes up a perfect twist. They offer Chocolate, vanilla or both, and it is WELL WORTH the drive, or ride, out there to experience it for yourself. Happy riding folks! Don’t forget your helmet. A day of overdoing it. Sometimes, I just make judgment calls that really lack good judgment. We all do. It’s ok. Yesterday was one of those days. The good judgment calls included getting up early, getting my deliveries done, not spending too much time hanging out to drink my coffee, and getting ready for my Sunday ride. I planned on going up to Kortright Centre for the last day of Maple Syrup Fest. All was going smoothly. Checked my tires, a ok, packed some fuel in my knapsack and was ready to go when I decided to, instead of just going, text my friend David to meet me for a coffee. Hadn’t seen him in a while and wanted to hang out… he is perpetually later than he says he is going to be, so my precious morning was flying by one minute at a time. Eventually we made it to the cafe, had our coffees (I figured the extra caffeine would surely help me complete the 60km ride I had mapped out, despite it being a diuretic) and then I was on my way. Toronto is beautiful in the spring, and even more magical when I’m on my bike in areas of the city I have never explored before. Out along the Annette St. bike lane, into Baby Point, and up the Humber West Rec Trail, I was pedaling hard and loving the scenery, forests, rushing river beside me, and the crisp, sunny weather. One thing on my mind…maple syrup. Unfortunately, and even though I have won orienteering awards in my youth, I read the tiny little map on my iPhone incorrectly and was thrown off course up Pine Valley Dr. north of Langstaff. I was lost, exhausted, and not really sure what to do next. Next questionable judgment call that I made was to instead of continue on my way to Kortright Centre and the promised land of Maple Syrup, I rerouted to Kleinberg thinking that this could be my first century (100km) ride! I was pumped, and also looking forward to check out the cafe at the McMichael Art Gallery. Finally finding my way up Islington, I made it to the gallery and checked out the menu at the cafe. It was horrendous. The little room, with no open windows on a perfect spring day had nothing going for it, so I turned around again in search for lunch, or at least something with sugar in it. 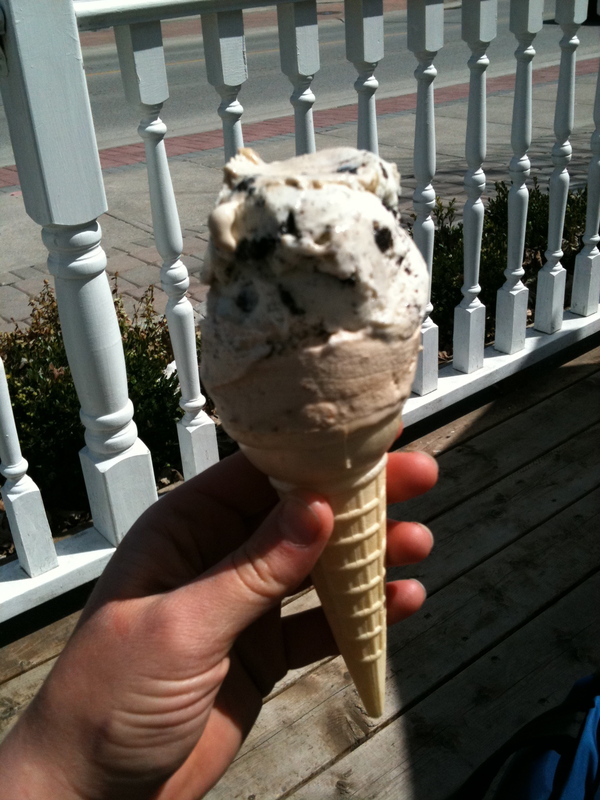 Ice cream was basically the only thing available in sleepy Kleinberg. I indulged gleefully with two scoops of Breyer’s Maple Walnut and Cookies and Cream. I can’t actually remember the last time I ate such a ridiculous amount of ice cream! So, I had to mentally prepare for the ride back as I licked the drippy edges around the top of my cone. I had already cycled 50km. Back down Islington and hooking up to the West Humber Rec Path again, I flew back into the city… but by the time I made it to my turn off I had only gone 80km, so I decided to push on down to the water, across the lakeshore and into High Park. It, being a beautiful day, was so crowded with sunny families that I couldn’t stand the stopping and starting, went out of the park and headed home. I stopped at Rowe Farms for a recovery meal and picked up my favourite chicken wieners, and stopped at the church on Roncesvalles to pay my respects to the Polish community for their tragic loss. I considered cycling around town a bit to get in the last ten km, but decided that I would just call it a day. Without even getting my bike inside or washing my hands, I crashed in the backyard and ripped open the wieners with my teeth, then proceeded to eat every single one of them. Not smart, but so salty, so satisfying, and the best recovery meal ever! But wait, that wasn’t enough! My body craved carbs and I went straight for Dan DeMatteis’ gorgeous fresh goat cheese filled ravioli. I basically couldn’t move for about half an hour, was completely overstuffed, and then decided to go for a walk to keep my legs from cramping up. So, the 90.18km, multiple espresso in the morning, huge ice cream, five chicken wieners all at once, a potful of ravioli, and a two-hour walk, followed by cooking my lunches for the next week and eating four of Alex’s freshly baked vegan choco-chip cookies, was I think, an example of one of those days I may have overdone it a bit. Thank goodness for my uber-comfy, non-toxic, organic latex mattress which cradled me all night long as I slept like a log. ZZzzZzZZzzzZZzZzz.